Dr. Murugar Gunasingam has completed a pathbreaking and pioneering study of the Eelam Tamil quest for self-determination under the able guidance of my good friend and one-time colleague, the late Dr. Sinnappah Arasaratnam. This study in my view will receive the plaudits of all students of Sri Lanka's politics and modern history. For this meticulous work of scholarship, Dr. Gunasingam was justly awarded the degree of Ph.D by the University of Sydney. In undertaking this study, Dr. Gunasingam has left no stone unturned in his search for bibliographic material. Not only has he focused on almost every available source but he has also brought an analytical mind to bear on their veracity. His critical bibliography will be most welcomed by the world of Sri Lanka scholars and we are all in his debt for his untiring efforts. Some of his sources are highly original and they see the light of day for the first time. Nationalism is a many faceted phenomenon in our present world of bloody ethnic strife, a fact of life which was not foreseen by any of the great social scientists or thinkers of the past. What effects such self-destructive and internecine ethnic strife will have on global equilibrium is fearful to contemplate. The examples of Kosovo and Rwanda, leave alone other uncared for and lonely outposts on the globe, are still to unfold themselves in the final reckoning. For ethnicity is global and infectious reaching almost epidemic proportions in countries where minority groups strive for a fair share of the ever-shrinking national pie and feel neglected, if not adequately cared for, and are not endowed with equal rights with an independent judiciary and enlightened forward-looking political leadership, especially from the majority ethnic group. Dr. Gunasingam has raised these questions with all their ramifications in his comprehensive thesis. 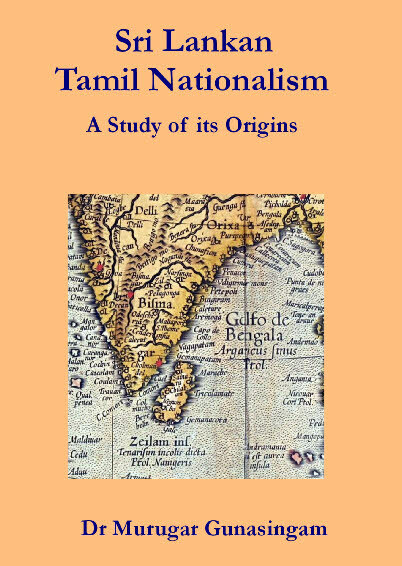 Dr Murugar Gunasingam has written four research books including the critically acclaimed 'Sri Lankan Tamil Nationalism: A Study of its Origins' and 'Tamils in Sri Lanka: A Comprehensive History (C. 300 B.C. - C. 2000 AD)'. Gunasingam gained a Masters degree from the University of London and a Ph.D in History from the University of Sydney, under the Australian Post-graduate Scholarship Award. Gunasingam has worked as a research fellow at the South Asian Studies Centre, Sydney. He also served at Charles Stuart University, the University of Western Sydney and the University of Jaffna during his career.